Passers-by cringed and covered their ears as opponents of the F-35 staged a noisy demonstration in Burlington's City Hall Park on Tuesday morning. It wasn't the chanting and drum-banging typically heard at protests that was causing those within earshot to wince in pain. It was what organizers said was a replication of the roar the F-35 would produce over downtown Winooski at an altitude of 1000 feet after takeoff from the Vermont Air Guard base at Burlington International Airport. "You're making my walls vibrate!" 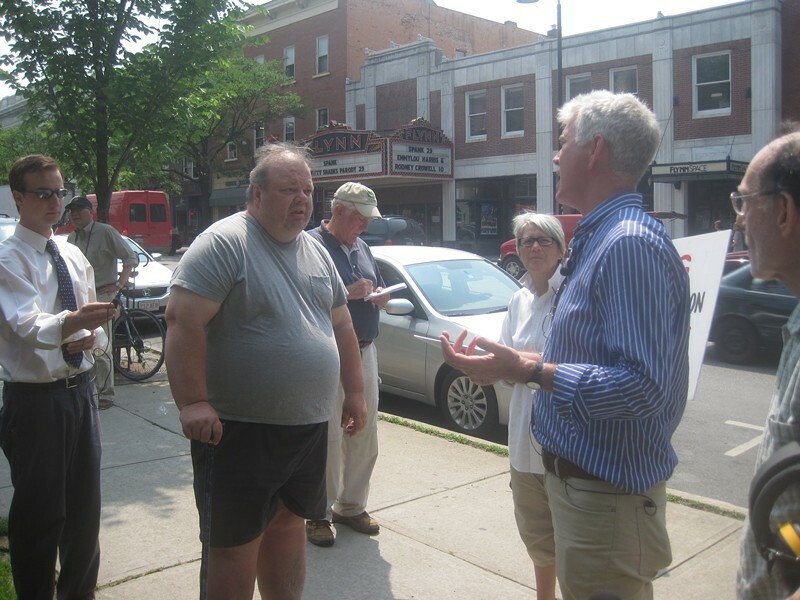 a nearby resident complained to protest leader Chris Hurd at the conclusion of the six-minute-long blast of sound. David Harrison, who lives at 141 Main Street, told Hurd, "You're disturbing businesses across the street." A couple of the F-35 opponents gathered for the media event responded in unison, "That's exactly the point." Prior to unleashing the thunderous din from a set of eight speakers mounted on a trailer, Hurd said he wanted to apologize to everyone in the area for what they were about to hear. "We never wanted to do this, but Miro Weinberger and Peter Shumlin haven't met with any of 8000 affected citizens," Hurd said, referring to the estimated number of residents near the airport who would be subjected to high noise levels from the F-35. "The mayor says this level of noise is fine for people living in noise-affected areas in Burlington and Winooski," Hurd added as organizers fired up the speakers. He explained afterward that the six-minute audio recording had repeated in a loop the noise a single F-35 generated at takeoff in May from a base in Texas. The sound had been digitally recorded there by Dutch journalists, Hurd said. That audio file can be heard here. 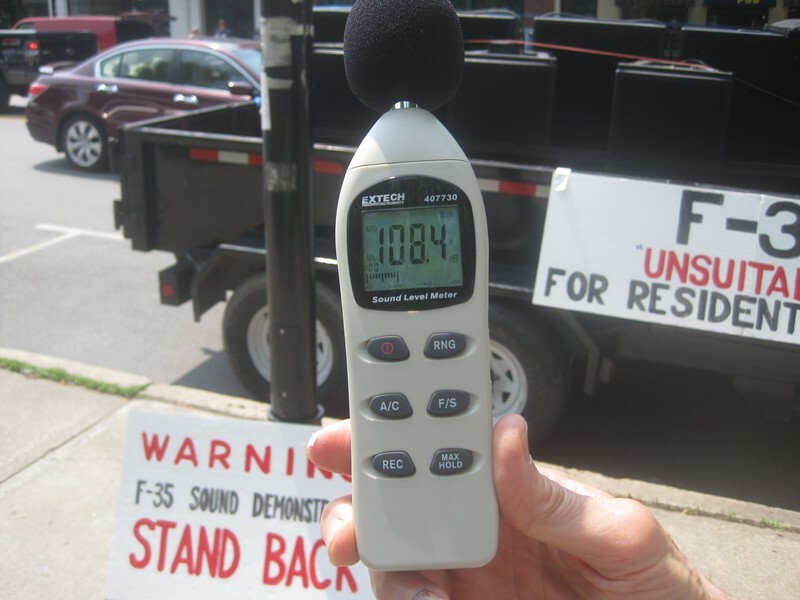 Those in City Hall Park on Tuesday were exposed during the six minutes to noise levels ranging between 105 and 115 decibels, said protester Richard Joseph who had been holding a decibel reader near the speakers throughout the demonstration. The 115 level is what the F-35 would produce over Winooski, he said. Hurd said the $1040 cost of the equipment used in the protest was covered by Ben & Jerry's cofounder Ben Cohen, a prominent F-35 foe. Opponents of the plan to base the F-35 at Burlington airport were scheduled to repeat their noisy protest on Tuesday afternoon outside the office of Gov. Peter Shumlin in Montpelier.